A little background...I work in a big office. The group I work is made up primarily of professionals who are in their 30's and early 40's. As a result, it seems, there is ALWAYS someone who is expecting a baby. I keep telling them all, keep it to yourself! I've had plenty thank you! If someone hands me water from the machine in our kitchen I'm NOT going to drink it. So...I had seen these great kids blocks in a store, and I went home to try to make some. 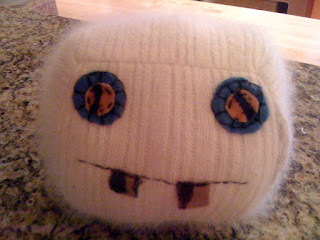 I felted a fluffy white sweater, thinking it would be really soft and great tactile fun for an infant. I cut six pieces, the same size, and made a cube with them. Then stuffed like crazy. Of course, my first attempt wasn't nearly what I was expecting. But when I showed my son Ben what I had come up with he thought it would make a great "plushie". So we found some felt to make eyes and mouth with.